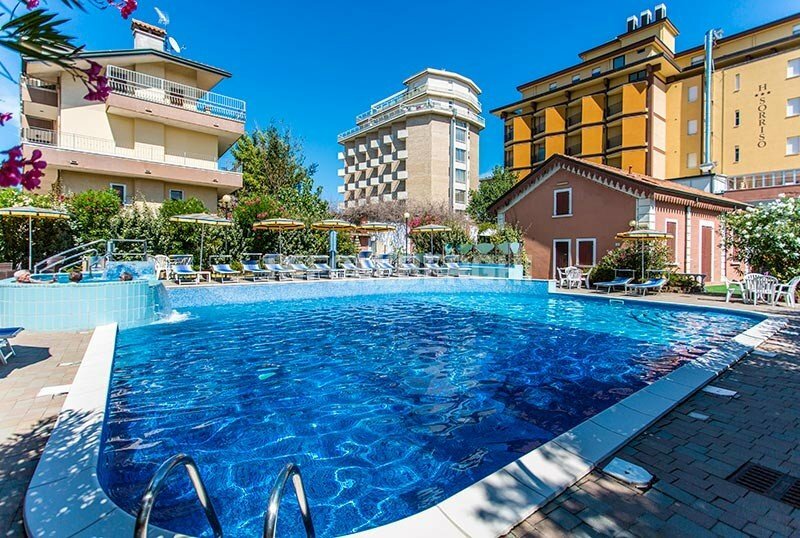 The 3-star Hotel Sorriso in Bellaria is a family-friendly hotel with swimming pool, solarium, parking, free Wi-Fi, rooms with sea view and air conditioning. Pets are allowed. Hotel Sorriso is just a few steps from the beach, which can be reached by a short walk with no roads to cross. Nearby there is also the bus stop connecting Bellaria to Rimini. The rooms have a balcony (also with sea view), free WI-FI, safe, satellite TV and digital terrestrial, minibar, bathroom with hairdryer and courtesy set. Air conditioning, subject to charges. FAMILIES: family solutions with sea view available. Large, well-kept garden with a playground area for children, swimming pool with Jacuzzi and sunbathing area, open-air porch, free bicycles, TV room and reading room, lift. PARKING: covered available 3 parking spaces, uncovered for all customers. WI-FI: in the whole structure, swimming pool included. AIR CONDITIONING: present. Payable in the room. CONVENTIONS: beach, amusement parks, organized excursions for a fee. LUNCH AND DINNER: local cuisine with a choice of menus, followed by a buffet of salads and vegetables, and homemade pasta and desserts. In the hotel: playground, heated swimming pool. On request and for a fee: strollers, baby sitter and pediatrician service. At meals: seats, past and / or vegetable stock. The hotel offers its guests a large swimming pool, surrounded by greenery, with WI-FI, heated water, with hydromassage, children's area and sunbathing area with sunbeds and beach umbrella. Il Sorriso has an agreement with Bagno Elmo 24 in Bellaria, which is just a few steps from the hotel and offers numerous services and moments of entertainment. The prices of the list are per person per day for a min. 3 days. Special Families: Until 16/06 1 child up to 12 years FREE if in room with 2 adults. Promotion valid for stays of at least 6 days. Special Families: From 31/08 onwards 1 child up to 12 years FREE if in room with 2 adults. Promotion valid for stays of at least 6 days. Stay in All Inclusive formula in the Classic Room. From 31 May to 7 June 7 days package at € 340.00 per person Full board € 290.00 Stay in All Inclusive formula in Classic Room. Stay in All Inclusive formula in Classic Room. Minimum stay 3 days € 160.00 per person.